Tzipi Shlissel, long-time Hebron resident and author of the newly released book Hebron Breaks the Silence led a tour of Hebron's historic casbah. Once part of the Jewish quarter, today the area resembles the Muslim quarter of Jerusalem's Old City with its narrow alleys lined with small shops. Although it is part of the Israeli controlled H2 section of Hebron, Israelis are only permitted escorted access with prior permission on Shabbat and special occasions. The bustling casbah is located about a five minute's walk from the Cave of the Patriarchs parallel to King David Street / Shuhada Street. Shlissel has lived in Hebron since 1998 but has a rich family history in the city. Her grandmother Tzipora, for whom she is named, lived in Hebron with her family. Her father, Rabbi Shlomo Raanan was a grandson of Israel's first Chief Rabbi Avraham Yitzchak Kook who also played a role in Hebron's history. Shlissel shared a story of her grandmother from 1928 in which she secretly prayed at the Tomb of Machpela. At the time, non-Muslims were banned from entering the Machepla complex and Jews were restricted to the seventh step of the staircase leading to the building. However one day, Tzipora borrowed a traditional Arab dress from her Arab neighbor, a laundress by trade and entered the holy site unnoticed. Hebron has grown exponentially since the end of the Jordanian period and what once was a commercial center is now a historic touristy area call "old town" by the locals. Today's true center of Hebron is located in the Palestinian Authority controlled H1 section, which comprises 80% of the city, the towering Hebron center shopping mall contains countless restaurants, clothing stores and retail outlets. International chain such as Mango clothing and Kentucky Fried Chicken are prominent in the downtown area. A soccer stadium, hospitals and universities are other major landmarks, all invisible from the dark, narrow alleys of the Casbah where falafel, wooden flutes, jewelry, pendants, live animals and more on sale. A few steps away from the western entrance, Shlissel climbed a vintage staircase to point to the home of Bechor Levy, the famed educator who worked in Rehovot as a teacher and principal for over 40 years. Today a school in Rehovot is named in his memory. He got his start in Hebron, where he was fluent in both Arabic and Hebrew. The mezuzah slot can still be seen on the doorpost of his house, the mezuzah having been removed long ago. She also pointed out a former synagogue building and explained the struggle for Jewish-Israelis to re-purchase properties lost during the 1929 riots. That massacre, in which 67 civilians were killed, resulted in the removal of all Jewish residents, her grandmother's family included..
Next on the tour was the site of a 1985 stabbing attack in which IDF soldier Avraham Sorek was killed. The 38-year-old reservist was an immigrant from Chile. The Jewish Telegraphic Agency reported at the time, "shortly after the stabbings, Jewish settlers tore down a wall separating the casba from the Jewish quarter of town. They said it was a symbolic reply to those who do not want Jews in the casba." The tour continued as it passed vendors selling soap, olive oil and flutes to the gate that once led to the historic Jewish Quarter, once called the "Jewish ghetto" in writings of the time. Researchers note it was the only location in the land of Israel to be called a "ghetto." The entrance was hidden by a variety of scarves and hats from nearby shops. A local salesman who lives in a nearby shop revealed that still today the gate is called Bab Haret El Yahud (the gate of the Jewish Quarter) and that there were many Jewish-owned shops there until the 1929 riots. The next stop on the tour was a brightly lit area which Shlissel identified as the spot described by the 17th century traveler Moshe Yerushalmi, author of The Journeys of the Karaites to Eretz Israel - 1655-1654. Reprinted in modern times, the travel journals describes visiting Hebron's Jewish quarter on Rosh Hodesh Chanukah, and the hospitality he enjoyed from the locals. A little further away located in front of a pigeon shop was the entrance to the first house built outside the Jewish Quarter. It was owned by Itche Slonim in 1861 and was famous for its red tile roof, which was unusual compared to traditional Arab construction. Today, gentrification has destroyed the once distinctive roof, but like other buildings in the casbah, the mezuzah slot still survives. A house next door still displays a Magen David (Jewish Star of David) symbol above the doorpost. It was called Kabbalists Corner and served as a synagogue and study hall. Clearly visible plaster filled the slot where the mezuzah once was, almost concealing it. Former mezuzah slots were visible on each of the inner doors as well. Today, the building serves as an animal pen. The tour participants were told that the current residents and vendors pay rent to the IDF Civil Administration because the building is owned by the Israeli government. 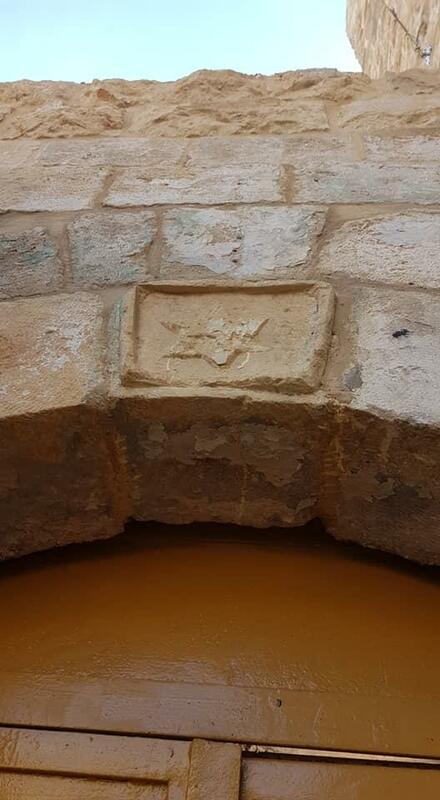 Next on the tour was the "Mashkof HaMenorot" or Lintel of the Menorahs, a historic archway that once displayed a stone-carved depiction of three seven-branched menorah symbols. The original stones were estimated to be from the time of the Second Temple Era. In 2014 the decorative archway was removed completely and paved over with concrete. The journey continued through the lower Casbah to a structure whose past splendor was still visible. Supported by marble columns with decorated iron-wrought windows, the building was home to the Anglo-Palestine Bank. Opening in 1907, it was the third branch of the institution which later became Bank Leumi. Serving both Arabs and Jews, the bank brought economic prosperity to Hebron during a period when it was considered a backwater town. Next on the tour was Beit Magen Avot, built by the Rivlin family, which featured a rare pewter installation in the lintel. A plaque nearby was dedicated in memory of Yehoshua Salome who was murdered in 1980 while shopping, the first civilian to be murdered in Hebron since 1929. The tour of the casbah ended in front of Beit Romano which was built by a wealthy Jewish merchant in 1862 at what was then, the edge of the city. As the group exited the casbah, the tour continued down King David Street to the checkpoint that separates bustling PA Hebron from the Israeli side. Shlissel pointed over the guardrails to a building where her Aunt Leah and grandmother Tzipora once lived. The rest of the trip was dedicated to areas within the current confines of the Jewish neighborhoods with such sites as Beit Hadassah, the newly inaugurated Tel Hevron archaeological garden, the Tombs of Jesse and Ruth and the Beit Menachem apartment complex.